To determine your needs, it is a must that we comprehend your entire financial picture. This goes far beyond specific asset management or estate planning and focuses on your most important values, relationships and lifelong dreams. Our conversation will focus on seven important categories to help us gain a better understanding of what our role can be in helping you achieve all that is important to you. Drawing from the information we gathered during the Discovery Meeting, the investment plan portion of the wealth management plan documents all seven areas of your Total Client Profile. The most critical area for investment decision making concerns your financial goals. By putting these goals in writing, the investment plan ensures that we both are completely clear about this critical area. We work closely with those individuals with whom we can make a significant impact – we understand that we are not the right fit for everyone, and it is not our intention to be. Considered the most important part of the entire consultation process, the mutual commitment meeting gives you full opportunity to have reviewed our recommendations prior to making any commitment. We are interested in long-term, client-advisor relationships and this step is an integral part of helping us both make that commitment. Because of the amount of paperwork generated during implementation, it is quite easy for you to become overwhelmed in the weeks following the implementation of the investment plan. 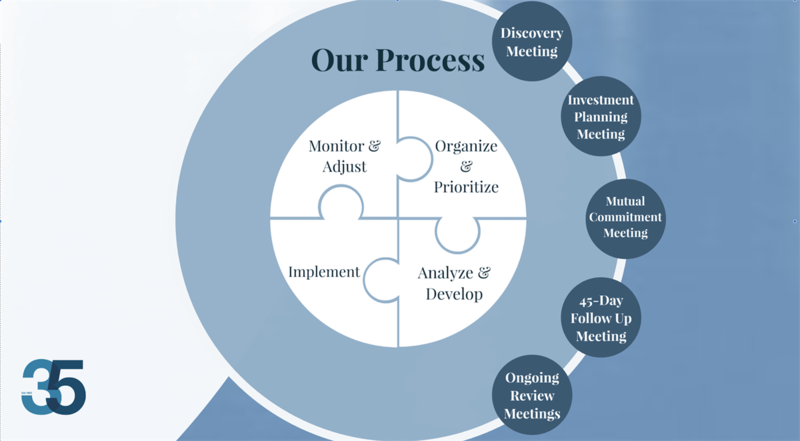 This meeting allows us to help you understand and organize this financial paperwork and gives us the opportunity to introduce our team who will play integral parts in the ongoing implementation of your Wealth Management Plan. These meetings are an opportunity to continue to build a relationship with you and continue to help maximize your probability of achieving all that is most important to you and your family. In addition, at our first Regular Progress Meeting, we will introduce our Advanced Plan which contain recommendations that are specifically designed to address your most pressing financial concerns.